Miss Havisham is a cold hearted and angry spinster who lives in a large falling down mansion house in Kent, England. After being jilted many years ago by the love of her life, she is determined to hold on to her hurt and devastation this caused her and wears the wedding dress every day of her life. With a kind of cruel and obsessive manner, Miss Havisham adopts Estella and raises her as a weapon to achieve her own revenge on men. The problem is that Estella not only takes a dislike to men, but also doesn’t love or have any feelings for Miss Haversham. Living a lonely life and never venturing from the house she becomes reclusive and the object of local gossip. She is a control freak who uses her wealth to wield power over men and needs a strong character to show her the errors of her ways. Dorian is a handsome and wealthy gentleman who was orphaned as a child and brought up by a loveless tyrant. After coming into the companionship of Lord Henry, Dorian’s life begins changing when a portrait of him is painted. Long gone is the naive young man first introduced to us and he is replaced with a character who believes that life is to be lived and that sin is a way of life. Throughout his life, Dorian treats people horrendously. Over the years as Dorian gets older and his life spirals out of control, people start to gossip, not only about his behavior, but also about the fact that he never ages. With living life on the edge and after sinning on numerous occasions people can’t believe that in 18 years he hasn’t aged one bit. What people don’t know is that the painting that was produced 18 years earlier that Dorian had put in the loft, is aging after every sin he makes. We believe they could be an interesting match. They are both headstrong characters and both lived in the past – Dorian through never ageing from his younger years and Miss Haversham by always wearing her wedding dress, after being jilted by a previous partner. Both characters use people, are not particularly nice to others, have various obstacles to overcome and are hard to like, but if you really look deep, they are both vulnerable people in their own ways. Maybe they would be too similar to get on, but if they actually looked at each other’s lives and personalities they may be a strong match. Miss Haversham needs a strong character to look after her and be company for someone who is extremely lonely. Her character would not be suited to an easy going person, as she would walk all over them, she requires someone with worldly experience and a strong personality to stand- up to her. Dorian is all these things, but deep down (like Miss Haversham) is struggling with his own demons about ageing, money/class, plus a life that is going out of control. Maybe, the two characters who both have different lives could comfort each other. Dorian leads a life of excess at every level and Miss Haversham is a recluse who lives in the past and can’t move on and live her life, plus hates men. Dorian could teach her that life is for the living and to go out there and enjoy life a little and Miss Haversham may take a controlling hand towards Dorian and calm him down. They would both fill an empty void in each other’s life and could learn a lot from each others insecurities and mistakes. 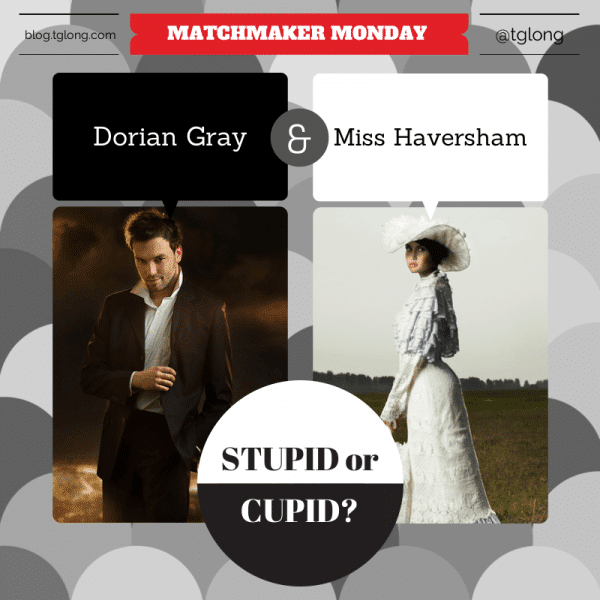 These are our thoughts, now we are interested to hear your thoughts and if this match would be stupid or cupid. Thank you so much for stopping by, Glada!